As you can see on the image, a client adds a job to a database, while a server fetches the database and perform jobs in background. both a client and a server have access to the shared database and assemblies where job classes are declared. There is load scalability – you may increase the number of servers. Hangfire cannot work without databases. 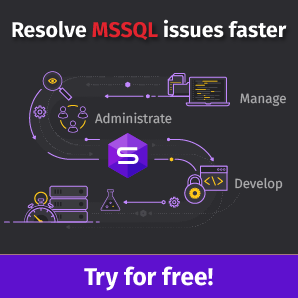 By default, it supports SQL Server, and there are extensions for popular DBMS. The commercial edition supports Redis. You may use Hangfire in ASP.NET applications, Windows Services, console applications, as well as in Azure Worker Role. From the client’s perspective, working with a task is based on «fire-and-forget» principle. There is nothing happening on the client side other than saving the task to a database. This information is sufficient to call the Methodtorun method in a separate process through reflection, provided you have access to the Hangclient assembly in which it is declared. The client and server should have access to the shared assembly, while the embedded interface does not require it. It is possible to replace the implementation of the stored job by replacing the assembly, which the server application refers to. It is convenient for recurring jobs if MethodToRun matches both in old and new assemblies. The only restriction is to have a public modifier. It may even retrieve the EmailSender instance using a DI-container. 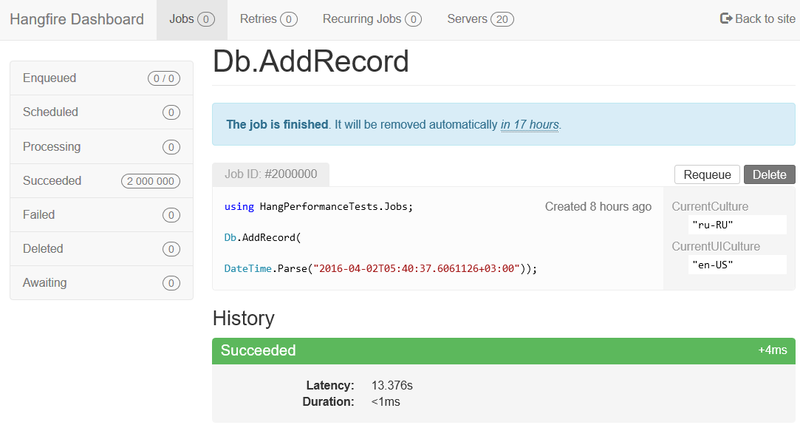 After the service start-up, the Hangfire server will start retrieving jobs from databases and execute them. The server contains its custom thread pool implemented using Task Parallel Library based on Task.WaitAll. For more information, refer to BackgroundProcessingServer. We can create any amount of Hangfire servers and do not care of their synchronization. Hangfire ensures that one server will execute only one job. You can check it using sp_getapplock (Refer to the SqlServerDistributedLock class). As it has been discussed, the Hangfire server does not require any particular host and can be deployed from Console App to Azure Web Site. 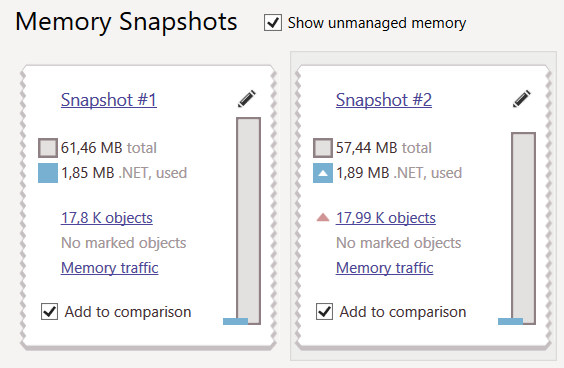 When hosting in ASP.NET, you need to take into account such general features of IIS as process recycling, auto-start (startMode=«AlwaysRunning»), etc. However, a scheduler documentation provides meaningful information in this case. In addition, the quality of the documentation is perfect. 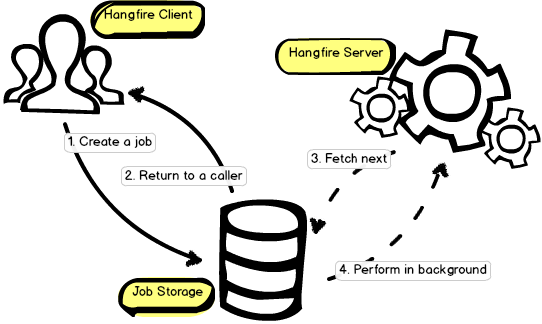 The source code of Hangfire is public and of high quality, as well as there are no barriers to deploy a local server and debug a code. As an alternative to Hangfire, in .NET framework, we can use Quartz.NET, a port of Java task scheduler – Quartz. Quartz.NET solves similar job, as well as supports any amount of clients (creating jobs) and servers (executing jobs) that use a shared database. However, they differ in their execution process. I must admit that my first experience with Quartz.NET was not successful. The code from GitHub had not been compiled until I manually fixed references to several missed files and assemblies. There is no splitting into server and client parts in the project. Quartz.NET is applied as a separate DDL. So, if you want the particular instance to add jobs, rather than to execute them, you need to set up the instance. Quartz.NET is free and allows you to store jobs using in-memory, and popular databases (SQL Server, Oracle, MySQL, SQLite, etc.). The in-memory storage keeps data in the memory of one server process that performs jobs. It is possible to implement several server processes only when storing jobs in the database. For a synchronization, Quartz.NET uses one common algorithm. For example, by signing up in the QRTZ_LOCKS table, you can simultaneously perform only one scheduler process with a unique ID. 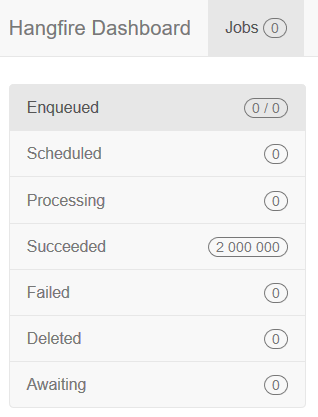 A simple status modification in the QRTZ_TRIGGERS table will return the job to be performed. With a similar restriction, it is easy to serialize the job: a database stores a full class name, which is enough to get a type of the job class using Type.GetType(name). The JobDataMap class allows passing parameters in the job. In addition, you can modify parameters of the stored job. As for multithreading, Quartz.NET uses classes of System.Threading: new Thread() (refer to QuartzThread), custom thread pools, and synchronization using Monitor.Wait/Monitor.PulseAll. The official documentation does not provide much information on this topic. Have a look at this part on clustering: Lesson 11: Advanced (Enterprise) Features. On the StackOverflow site, a user recommended referring to Guides on Quartz. Since Java and .NET developers do not support similar API, Quartz.NET does not have many releases and updates. In my opinion, Hangfire is better. It is a free and public service, which cuts costs on development and maintenance of distributed systems. Do you use anything like that? I suggest sharing your thoughts in comments. Ilya is a lead C# developer at bi.zone (Moscow, Russia). He is involved in enterprise development, including distributed systems and web services.